Do you like to be awed by old-growth forest? Take a look at big trees and compare their time horizons to our own life spans. Many trees in the Pacific NW can live well beyond 1,000 years, becoming gigantic in the process. 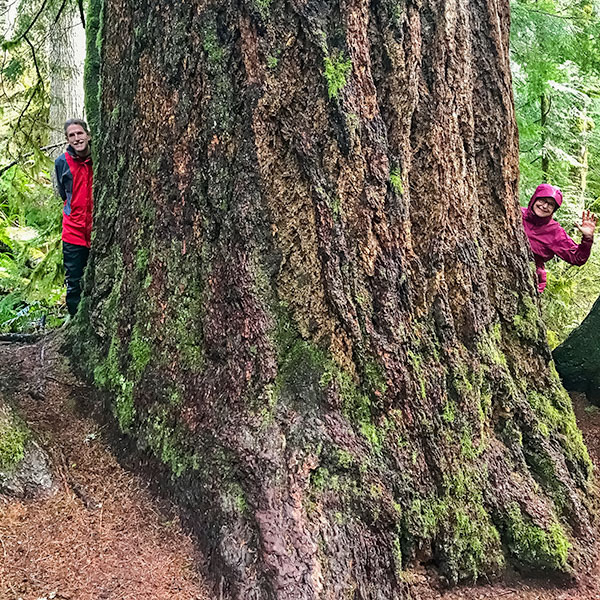 Wherever you live in the Pacific NW, there are at least a few big trees that you can visit on a day-trip. What do I mean by "big trees?" How about this definition: Trees that were growing here before European contact, before Capt. Vancouver, before Lewis & Clark, and that are big. Using my definition (i.e., pre-European contact), how do you tell whether a tree is a "big tree" without cutting it down and counting the rings? The answer is simple: You know them when you see them. They stick out like sore thumbs because, regrettably, virtually the entire Pacific NW has been logged (several times, in most areas). Big trees usually occur only in ones or twos or in small groves, even in our national parks. Due to favorable growing conditions and historical logging, you are more apt to find big trees on the Olympic Peninsula (especially in Olympic Nat'l Park) than most other places. Record-sized trees of several species live on the Olympic Peninsula. But there are hundreds of other spots, scattered throughout the Pacific NW, where big trees also live (including east of the Cascade crest, where big trees are a bit smaller). When you look at the photo of the big Sitka spruce (above), you may automatically think "Olympic National Park." Surprisingly, this particular Sitka spruce lives in the Cascades, not far from the Cascade crest!! Lewis & Clark, in their journal entries of February 4, 1806, report being surrounded by Sitka spruce at least as big as in the photo above. They were near the mouth of the Columbia River. At that time, Sitka spruce was unknown to European science. 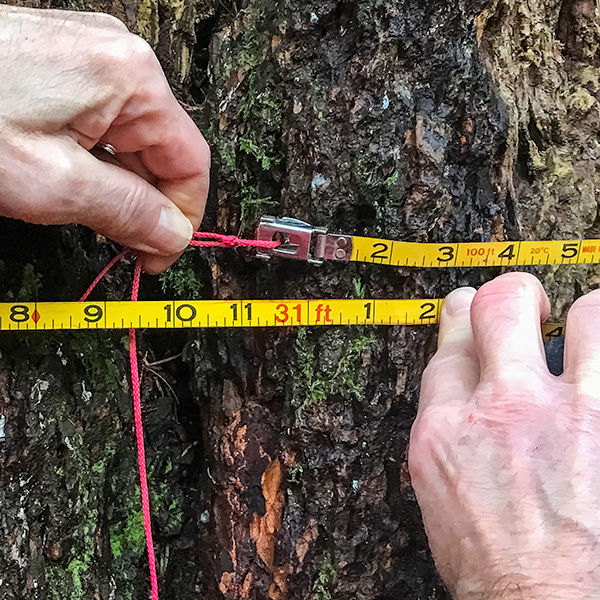 You can locate big trees near you by searching for "old growth" on the internet or contacting park rangers, including in local parks in cities. There are a number of big trees in parks within the city limits of Seattle, Portland, and Vancouver. Remember not to love big trees to death. Though I have no experimental evidence of this, it seems that too much foot traffic close to any tree, big or small, would eventually compress the soil, squeeze out the air bubbles, and harm the root system.